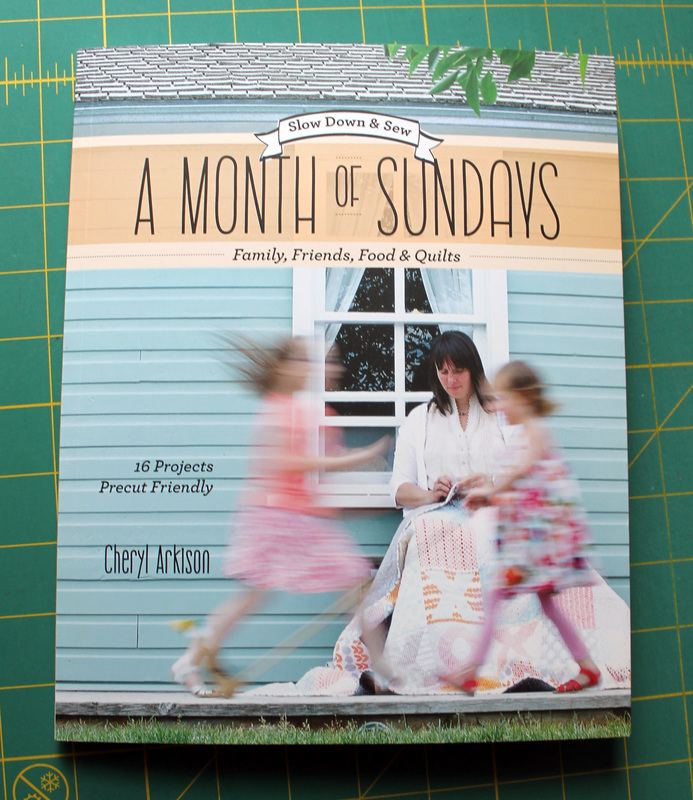 I recently had the privilege of receiving a review copy of Cheryl Arkison’s book “A month of Sunday’s”. The PMQG is often sent books to review and when this title was offered I jumped at it. I loved Cheryl’s first book “Sunday Morning Quilts” which she co-authored with Amanda Jean Nyberg. This book has a different feel and pace to it than Cheryl’s last book. It has recipes, bag patterns, musing on life and the best chapter EVER on low volume quilting. The chapter “Turn it Down” does a marvelous job of explaining what low volume is, how it works and how to select fabrics. It has tips on value, scale and colour in low volume fabrics and I learnt some neat stuff. 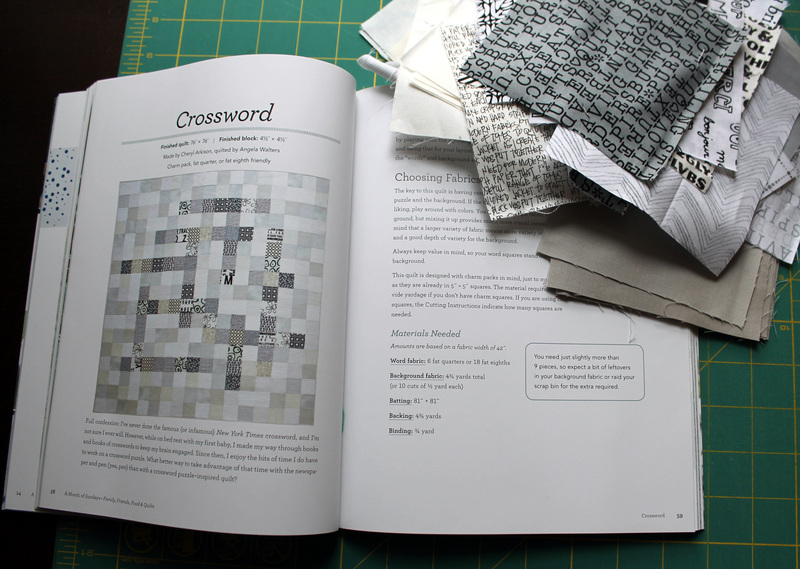 The book’s quilting projects are all fabulously low key, low volume and fun. You are challenged to take what you have learnt about low volume and apply it to patterns. There are helpful hints about turning up the volume on the patterns too but they are all perfect for the quieter style. So fabric was pulled (I had a surprising number of text prints!) and then cut. Now, after months of loud bright colours my design wall at the moment is full of scrappy low volume prints. The wall looks so strange with the random placement but as the rows are sewn together I am seeing some magic appear. I used more creams in my top, which gives my Crossword an old newspaper” feel I think. I have no husband for the weekend so I am hoping to have this top finished for a reveal next week. Wow, a real departure for you, and I do love what you have going on there. I can’t resist a book that makes you go straight to your fabrics and start pulling! 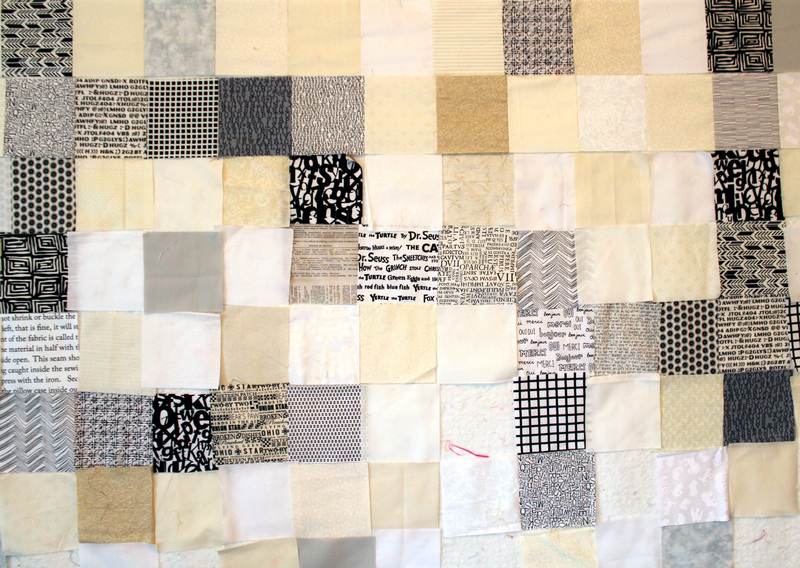 It does not happen often that I have to make a quilt from a book…I usually like to make up my own crazy. But this quilt had to be made. Lovely! A real palate cleanser for the change of seasons — transitioning you from your summer of starry night into your fall projects! Palate cleanser is a perfect description. That is exactly what this quilt is. Ooooh! I think I may need to add this book to my library! I am borderline obsessed with low volumes! I found this book great for helping me think outside of white and cream for lie volume. I am excited to try out some of my new knowledge on my next quilt. Oh I love the idea of adding pieced words…I was thinking of adding some in the quilting but your idea is more up my alley. This is a cute book, love that pattern! Neat. I always think of low volume as whites and grays, but I agree the creams are giving this a really nice look, definitely playing up the newspaper metaphor. What I loved about Cheryl’s book is that she made me look at my stash differently and find low volumes all over the place. I have a quilt in the early stages that really use an astounding array of low volume fabrics that I would not have considered using before. I’m glad you like the book! And that it got your straight to sewing. Now that’s a compliment! I too used the quilting to showcase the words, so of course I think that is a great idea! And the creams are perfect. Thanks Cheryl. I love the book and your Low Volume chapter was fabulous. I am going to recommend it ever time I get low volume question. 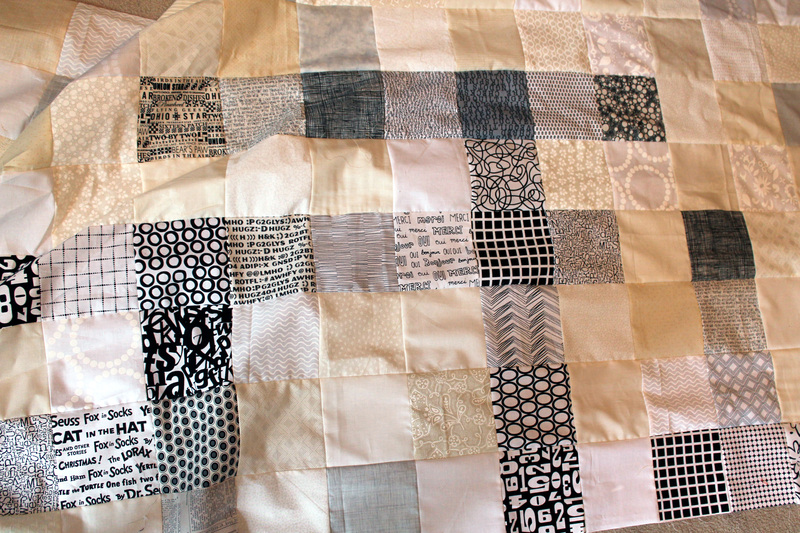 Of the quilting on this one will probably be straight lines if I quilt it and words if I get a long armer to do it. I will keep you posted on which way I go. Lucky you with the early book review! I really love this crossword quilt, it is so recognizable from afar, but complex to make it all appear that way. Fantastic! If I were a quilter, THIS would be the one I’d make, since I love crosswords and other word puzzles, and sewing! If you decide to dip your toe in the quilting pool this is an easy one to start with. Your work shows you have the construction skills to give it a go. Thanks so much – I do love that quilt. Someday, I might get brave and give ‘er a go. When I do, I’m coming back here to get more ideas! When you are ready let me know and I can help supply some of the scrappy fabric.